While everyone remembers what happens in the major tournaments, the landmark matches that Ireland play along the journey in qualification are often forgotten. The experience of following the Republic of Ireland is up and down to say the least. For every scintillating high, there seems to be an equally abysmal low. In recent times, we have experienced more of the latter. But as we look back on the history of the Irish football team, there are some days that stand out as being significant. While none of these matches came in the finals of major tournaments, they all had a lasting impact on the landscape of Irish football. Some were good, some were bad; all were important. Here are our most influential matches that did not take place in a major tournament. A game somewhat lost to history, the 1924 Olympics marked the first time the recently-founded Irish Free State competed competitively on the world stage. The story of how the existence of two footballing authorities came about in Ireland is a fascinating tale, one which can be further explored here. While the island of Ireland had been represented by a single team up until the 1920's, that was about to change. The favouritism showed towards Ulster players by the Irish Football Association (IFA), coupled with the wave of nationalism sweeping those in the south of the country at the time, led to the formation of the Dublin-based Football Association of Ireland (FAI) in 1921. As the newly-formed body, the FAI struggled to gain international recognition. They would however manage to become recognised by a growing organisation by the name of FIFA in 1923. As a result, they were invited to take part in the football tournament of the 1924 Olympics in Paris. Representatives from four clubs (Athlone Town, Bohemians, Brooklyn, and St James’s Gate) were selected after trials, with 16 players making the journey to France. Here they would defeat Bulgaria on a 1-0 scoreline, before eventually falling to the Netherlands in the quarter final. Now a sovereign nation, it marked the Ireland's arrival on the international stage. The Republic Of Ireland's 1-0 victory over Spain in Dalymount on 5th of May 1965 was not only important in seeking World Cup qualification (which we will get on to in a minute), it also marked Ireland's first use of the now famous granny rule. Manchester United's Shay Brennan won the first of his 19 Ireland caps on the day. Unlike those who played in the green jersey before him, Brennan was not a native Irish man. He was born and raised in the UK to parents hailing from County Carlow, choosing to represent his parent's country of birth on the international stage. The full back was a decent player, making over 350 appearances for Manchester United. However the significance of this event is not down to the player himself, but instead the precedent he set by appearing in this match. This marked the beginning of a long tradition in Irish football, with some of our most well-known players over the last few decades qualifying to play for the team under this rule. Ray Houghton, Tony Cascarino and John Aldridge are just some of the names who would follow in Brennan's footsteps. This was the start of a long history of questionable decisions made by the FAI. 25 years before their first World Cup appearance, Ireland nearly qualified for the tournament in bizarre fashion. Drawn in a three team qualifying group alongside Spain and Syria, the Asian country's withdrawal from the competition seen Ireland duel with the Spanish for a place in the 1966 World Cup. The two sides first met in Dalymount Park in May 1965, with a Jose Angel Iribar Cortajarena own goal handing the Irish a 1-0 victory. Five months later they would clash again, this time the Spanish coming out on top 4-1 in Seville. Before the days of aggregate scores, the only way to decide who would advance to the tournament in England was a play-off. The game was set to take place in London, something that was seen as an advantage for the Ireland due to the strong Irish contingent living in the city. Spain were unsurprisingly not pleased about this, and sought about finding a change of venue. Ultimately, it was decided that the game would take place in Paris. In order to push through the change, the Spanish federation offered to forfeit their share of the gate receipts to the FAI, a total of around £25,000. This was roughly three times the FAI's annual income at the time, although they would have earned far more if qualification for the tournament was secured. They chose the safe option and took the guaranteed payday. Spain would go on to win the game 1-0. Of the 36,000 fans who attended the game, roughly 30,000 were Spanish. It is impossible to know if a largely Irish crowd in Wembley could have changed the result, but in such a tight game it certainly wouldn't have hurt. The game which more or less sealed Ireland's first ever World Cup appearance. The qualifying campaign started poorly for the team, failing to win any of their opening three qualifiers. A loss to Spain was sandwiched in between draws with Northern Ireland and Hungary, leaving Jack Charlton's team in a precarious position with the Spanish set to visit Dublin in the next game. A fantastic performance saw them come away with a 1-0 victory in that match, which they followed up by beating Hungary and Malta. This meant that a victory over Northern Ireland in this game would all but secure qualification. 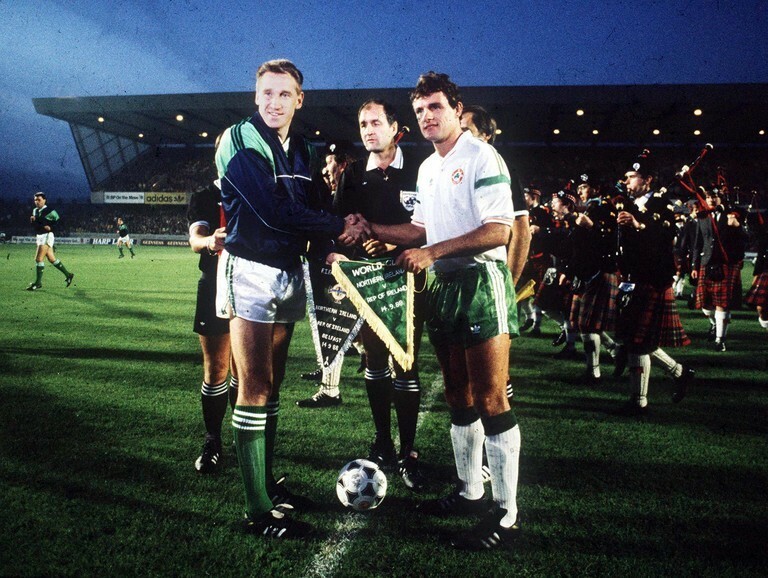 It was a game they never looked like letting slip, with goals from Ronnie Whelan, Tony Cascarino and Ray Houghton sealing a 3-0 victory. Securing the nation's first World Cup final experience is landmark in itself, but to do it against the Ulster men made it all the more sweet. With the pressure of reaching their first World Cup out of the way, the team would qualify again in 1994 and 2002. 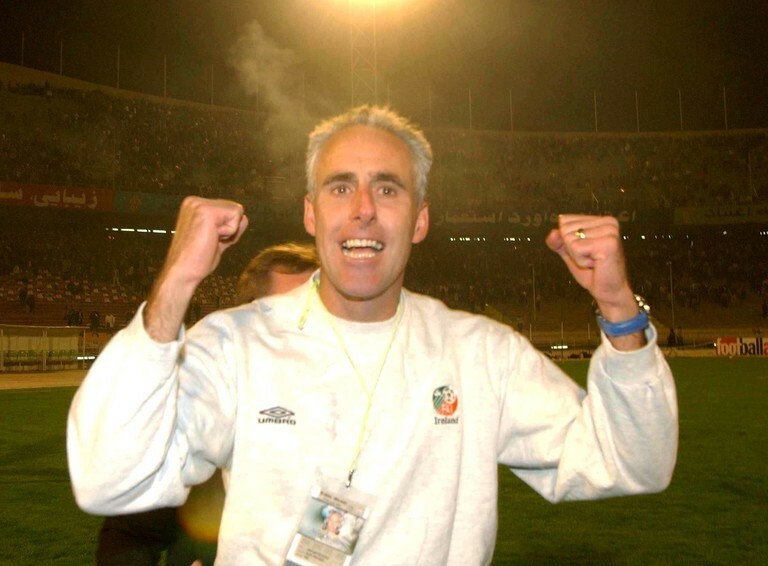 Mick McCarthy's Ireland team entered the second leg of their World Cup play-off in Tehran with the weight of their recent history resting heavily on their shoulders. In qualification for each of the last three major tournaments, they had exited via a play-off defeat. The Netherlands, Belgium and Turkey all dispatched of Ireland at this stage, and many had started to believe that the team simply did not have the mentality to perform on the big occasion. After missing out on automatic qualification to Portugal on goal difference, Ireland would play Iran in a play-off. A 2-0 victory at Lansdowne Road gave Ireland a decent cushion going into the return leg, but this was set to be something that the team had never experienced before. Speaking to the 42.ie, Shay Given recalled the game. It was probably the most hostile place I’ve ever played football in my life. We got there a couple of hours before the game and there was 100,000 people in the stadium already. We were getting off the bus and getting all sorts of stuff chucked at us. There were no women allowed in the crowd and all this kind of stuff. It was a very tense atmosphere. We came out to warm up and we were getting stuff pelted at us as well. Despite the immense pressure both on and off the pitch, Ireland held out well. A last minute goal saw them fall to a 1-0 defeat, but it was still enough to advance to the World Cup courtesy of a 2-1 aggregate victory. Finally the play-off curse was lifted. Ireland would go on to win further play-offs to qualify for Euro 2012 and Euro 2016. The lowest point in Ireland's modern footballing history. The appointment of Steve Staunton to the role of Republic of Ireland manager was one which was a strange one at the time. 'Stan' had no managerial experience, and Ireland had just failed to qualify for back-to-back tournaments. However this was seen as a transitional period in Irish football, and perhaps the appointment of a young manager would fit well with the emerging talents in the team such as Stephen Ireland. A 4-0 hammering in a friendly at home to the Netherlands was a sign of things to come. The media and fans quickly turned on Staunton. Despite being a legendary player, he was clearly not ready for the role of national team manager. And this was all before the game in Nicosia. The game itself was an unmitigated disaster. Cyprus had been whipping boys in European football, and to concede five was beyond belief. It was going to be impossible for Staunton to make a success of his time as manager after this result. Scraping a 2-1 win in San Marino just a few months later was the final nail in his coffin. The appointment of the former Liverpool defender was a horrific misjudgement on the part of the FAI, and something they have veered away from since. The last two managerial appointments have been of vastly experienced managers. Some would call them footballing dinosaurs. 12 years after Staunton got the job, perhaps now we have steered too far in the opposite direction. It had felt like forever since Ireland took a big footballing scalp before Germany rolled into town in October 2015. While the team often performed admirably against some of the big boys, we had never gotten that elusive victory. Germany were crowned world champions only a year previous to the game, and few gave Martin O'Neill's side any hope of getting the victory they needed to keep their Euro 2016 hopes alive. The importance of the win came not only in the three points that it secured, but also what it represented for the immediate future of this Irish team. For this group of players, it provided them with belief that they could perform against the big team on the big occasion. They displayed this belief in the incredible win over Italy the following summer. 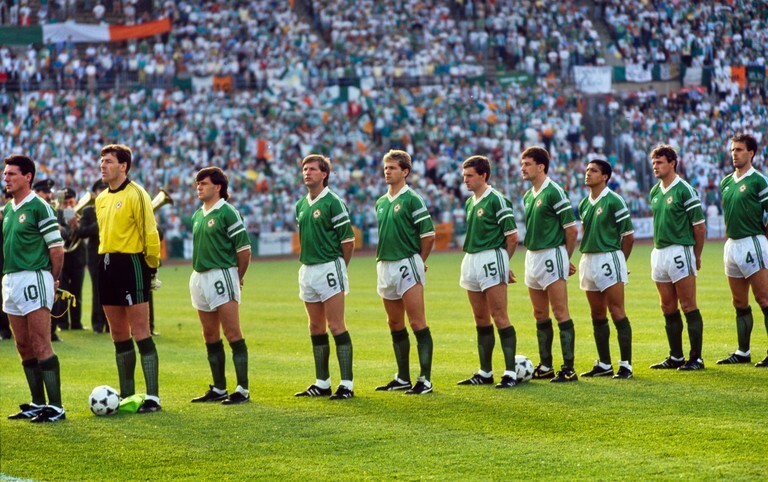 For the Irish fans, it gave a whole new generation a glimpse at what the glory days of Irish football were all about. Expectations had now risen, for better or for worse.